Home > Blog > Why Does My Bathroom Have No Hot Water? What can be more frustrating than discovering that there is no hot water after stepping in the shower? Here you are wishing to take a hot shower and all you get instead is pouring of icy cold water! When your whole house doesn’t have hot water, the water heater might be the problem, but when the hot water shortage is only in a bathroom, most likely something is wrong with the pipes. But before you start considering various options of repiping your entire house, just take a look at other reasons for lack of hot water in the bathroom. They are discussed in this article. There are usually valves installed in water lines that lead to bathrooms in order to shut off the water in case of repairs. The reason why you don’t have hot water in your bathroom might be that one of these valves is partially closed. Follow the pipe from the water heater to the bathroom and you should be able to find that valve. 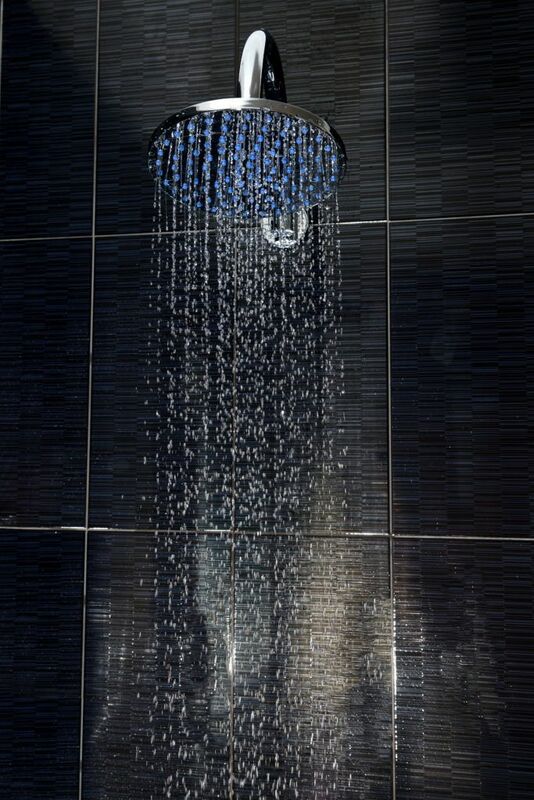 There is also a temperature regulating valve, which plumbers install to prevent scalding hot water in your shower. If you are lucky to find one of these, you have found the guilty party. Use a flat-head screwdriver to adjust the valves. If no adjustments work and there is galvanized plumbing at your home, corrosion might eat your pipes from the inside. Consult a plumber for the further course of action. This brings us to the next reason. If you happen to live in an old house, you water pipes may have corroded from inside, that’s why they are affecting water pressure in an upstairs bathroom. Galvanized steel pipes were installed a long time ago and they are known for corroding and restricting water flow. Hot water in the pipes makes it even worse. Hard water also influences copper pipes and they can get blocked with mineral deposits. In order to restore hot water flow in this case, the pipes need to be replaced. Contact a professional plumber. Sometimes a faulty bathtub faucet may cause the problem, especially if you turn it on and no water comes out. Something must be broken between the stem and the seat of the valve that controls the water flow. A worn out O-ring or a broken cartridge may as well cause improper mixing of the hot and cold water. If you never replaced a broken faucet before, it would be best to call a plumber, even though this is uncomplicated task. A hot water pipe can spring a major leak and this condition will cause the hot water faucet to flow poorly or not at all. Look for water damage and stains on the ceiling or crawl space below the bathtub, they will indicate a presence of a leak. However, leaks are harder to discover when the bathroom is located on the first floor of a home/apartment with a slab foundation. If you suspect a water leak, contact the plumber. It takes time for the hot water heater to heat water to the desired temperature level. If you have a large family, the problem might be the size of your water heater. It is just too small for your entire family. The available hot water is limited and its volume depends on the size of the water heater tank. Usually it takes 30 minutes to heat additional water after the tank has been drained. Also make sure that the water heater thermostat is set to the right temperature. Check the other hot water faucets at home. If the rest of your hot water faucets are not getting hot water or the temperature drops down quickly, this is a sign of your water heater malfunctioning. One of the heating elements in the unit could get out of order, which caused the water heater to make an insufficient amount of hot water. If cold water is coming out of all of the taps, the reason could be that the dip tube in the water heater tank has deteriorated. As a result, cold water is probably getting directly into the hot water pipe before it can even become heated by the unit. If all the mentioned reasons didn’t explain why there is no hot water in your bathroom, consult our plumbers from Brea/Orange County Plumbing Heating & Air Conditioning. We will gladly help you diagnose the issue and deal with it as required.